My last blog post ended with my statement that I was headed off to the gym. That didn't exactly go to plan, I made it about 90% of the way from my house to the gym before I needed to get out of the car to projectile vomit all over the place. The sickness had come on fairly suddenly, and thankfully I noticed it in time to avoid plastering my mates brand new focus in Wednesday's lunch. I spent the rest of the night in bed, cuddled up with a bucket, emptying what was left in my stomach. However, when I woke up the next day to leave for my treatment I was feeling ok all things considered. Again, though, I spent Thursday and Friday nights being sick into various receptacles around the house and laying in bed. Not the most glamorous and exciting of evenings. As I'm on both radiotherapy and chemo I'm not sure which is causing it or whether it is a combination of the two. Over the weekend I will just be on my chemo as I don't start back radiotherapy until Monday, so hopefully I'll be able to work out which treatment is the culprit. On a slightly more positive note, Piri is loving life in the house now she has settled in. She's going to the toilet on her mat and playing fetch (sort of, she's happy to fetch what you throw but less happy about the "drop" part of the exercise) but most of all she is brilliant at cheering everybody up. 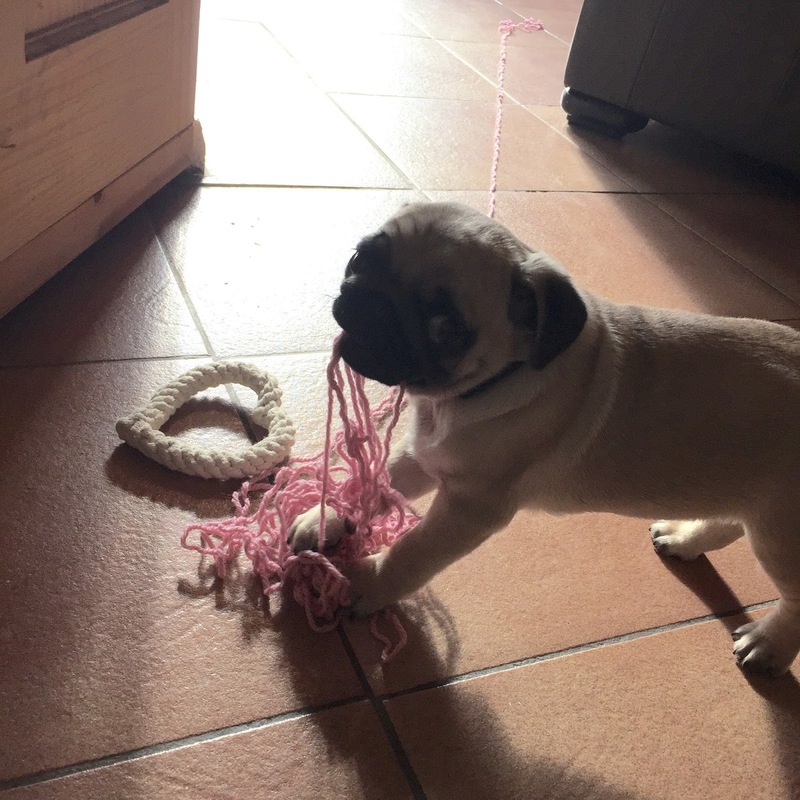 It is impossible to watch a pug confusing herself over a ball that squeaks or terrorising my mother's knitting wool without a smile breaking out on your face, no matter how bad things are. Poor old you, not fun, well done hanging in there and managing to be upbeat and funny at the same time. Minidog looks like a lively handful to me! !